Tap-tapping your earbud and asking your phone out loud to turn the volume up doesn't seem simple—but would a complex series of gestures really help? Making complex things simple: Perhaps more than any other trait, this is Apple’s superpower. When it’s at the height of its powers, Apple takes complex technologies and boils them down to simple products that delight their buyers. Complexity is always in our faces, shouting, demanding more. Cutting-edge technology is fundamentally complex. Integrating a suite of technologies together into a single product adds further complexity. We’re at fault, too, as users, and people like me who write about technology for a living are even worse. We frequently mark down products that are too simple and pine for added settings, more options, and extra complexity, without recognizing how much complexity can weigh down a product, robbing it of its essence. Apple can get this wrong. Worse, it can making this infuriatingly complex while in pursuit of simplicity, which in some ways explains the debacle that is iOS device syncing in iTunes. But when it gets it right, that’s when its products shine. This winter my podcast player has been full of voices (including my own) acknowledging that AirPods are an impressive fusion of cutting-edge tech with Apple’s trademark focus on simplicity. You could argue that the AirPods are great because they are so simple. “It just works” can be a punch line when things go wrong with Apple gear, but it-just-works-itude is what most Apple products should be shooting for. Imagine the ability to customize double-taps per earbud, so that a double-tap on your left ear can perform a different task from the right. Add in support for a triple tap. Now you’ve got a wider palette of gestures to choose from. But, at least for now, this is what we’ve got. It’s not unreasonable to wish that AirPods could do more. I’d love to be able to triple-tap to skip forward, or set the left earbud to receive volume-related taps while the right assumed control over play, pause, and skipping. But every addition to the complexity of the AirPods interface, as exciting as it might be, also erodes their simplicity. If you are a power user of the Bragi Dash, is it awesome that you have swipe- and tap-based controls on both ears that let you control your devices in numerous ways? Absolutely. But simplicity goes by the wayside. Balancing power and simplicity is hard. Apple generally errs on the side of simplicity–as anyone who has tried to use an Apple product for more than its intended purpose can attest. Apple’s products are certainly capable of complexity, but in general the company will always opt to make things simpler if it can manage it. Take my favorite feature of the AirPods, which is their use of built-in proximity sensors not just to turn themselves on and off, but to allow you to pause your audio by removing one earbud from your ear–and resume play when you put the earbud back in. That’s a natural physical gesture that Apple has turned into a user-interface element. Still, maybe the AirPods are too simple. I’d certainly like another gesture or two. But by incorporating a single on-device gesture—two taps—Apple is ensuring that its users will never get frustrated by their triple-tap being interpreted as a double-tap, or vice versa. A quick brush past the ear won’t be misinterpreted as a tap. And there won’t be any confusion about which ear is supposed to get the right number of taps in order to produce the desired effect. Siri, while complex and weird in its own ways, is Apple’s compromise. But I’ve set my AirPods to play or pause with a double tap rather than invoke Siri. Not only is Siri not good enough (and forces me to speak out loud in public settings), but if I’m going to tap my ears and pause my audio and have a chat with Siri, it feels more straightforward to use my Apple Watch or even pull out my iPhone. I do expect that the next generation of AirPods, whenever they appear–my money’s on 2018–will offer more flexibility than the current models. 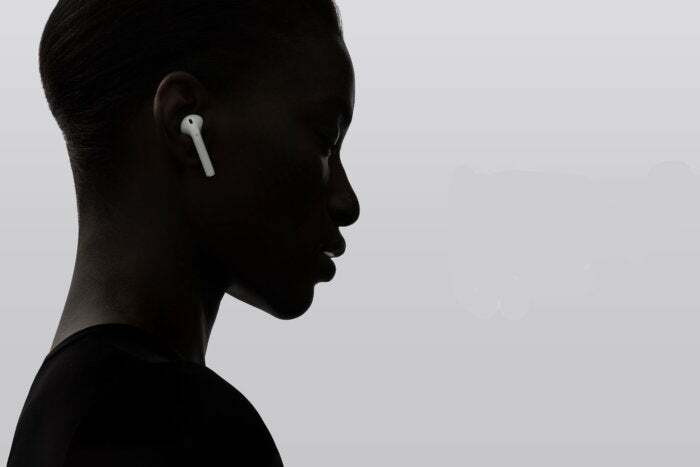 Perhaps Apple will be able to cram even more tech into those tiny earbuds and let us twist our fingers around the stems like virtual volume knobs. Perhaps it will offer additional interface options but turn them off by default. Perhaps it will do something none of us have even predicted yet. But in the end, Apple will do what it always seems to do: Frustrate all of us control freaks who want a little more power and customizability while simultaneously delighting us with the result of its insistence on simplicity.